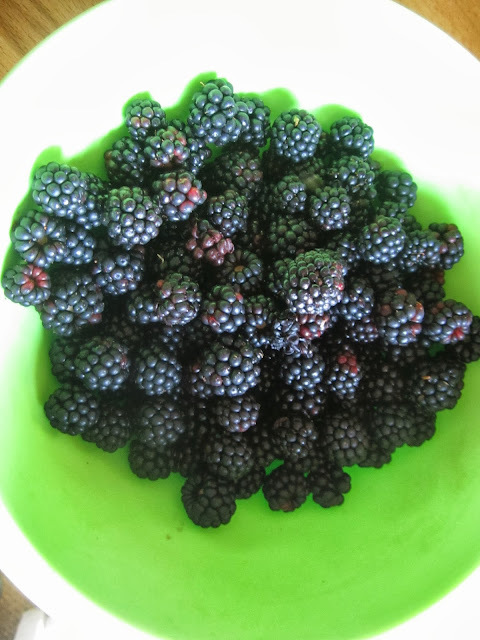 The remains of the huge basket of blackberries I picked in the brilliant sunshine on Sunday, just down the lane. The haul from our local market on Tuesday - I love to see this lovely old bowl piled up with fresh fruit and veggies. A courgette, leek and mushroom tortilla which lasted us two days, with a simple salad and some home-made salsa. An abundance of moth holes in my favourite cardigan has necessitated in another velvet patch. That'll teach me to hang it on the hangers in the porch! An abundance of time and materials has resulted in yet another pin cushion on the go! So many of you have asked if I sell my stuff - well, I have done, at craft fairs, but seem to have given that up for now. I am in the middle of a swap with the lovely Els over at Fiber Rainbow but that is the closest I've got to selling them. Who knows. And an abundance of time and feeling jolly found Jim and I driving across county to a tiny little village called Burnham Thorpe - whose chief claim to fame is that it is Admiral Lord Nelson's birth-place. 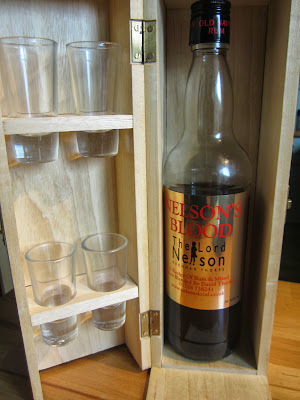 The pub we like to go to is called the Lord Nelson, and is indeed the very one that Nelson himself frequented. Lots of memorabilia abounds and we attended, with some Naval friends of ours, the commemorative dinner here some years ago which was a great event. We particularly like a drop of 'Nelson's Blood' a Navy Rum and clove elixir which the old landlord made over the years and sold the recipe to the new owners - though we think he held a little something back, as it isn't QUITE the same any more, we think. We tend to buy it as gifts for people we like, who we know enjoy it. In actual fact, I hate even the smell of rum, I seldom drink these days and very seldom spirits. But this stuff is wonderful! After a lovely lunch we tootled across the village to the church, where Nelson's father had been rector. We are not a religious family, but we are a Naval family, and sailors' hymns always make me cry. Nelson was my girlhood hero, and I felt quite choked wandering round the church, reading all the Nelson-related papers and information boards. On the prayer cross, made from some wood from HMS Victory, Nelson's flag ship, Jim pinned the names of my dad and his great friend, my Uncle Eric, both of them were torpedo'd in the war on the same day, though they were in different ships. Another moment for a bit of a tear-job! The lectern and something else are made from HMS Victory wood, donated by the Admiralty. "Let's drive back along the coast road and get some sea-food for tea." said Jim, so we did, and here are my final pictures of Abundance. When I was health visiting, I covered this area for some months for my colleague. I used to pop into this house for fish - in those days the 'shop' was a little lean-to round the back of the house! Now see how they have grown! And good luck to them too! Isn't it wonderful - the shop is in the little village of Brancaster Staithe. So, after spending a delightful time chatting to the owner about times gone by, we chose our goodies, and headed home, abundantly pleased with ourselves! I hope Abundance is making itself known in your home too. Have a lovely weekend. We have had lunch in that pub on one of our walks and very nice it was too! It's changed a heck of a lot since when we firs started going there, Dc, there was no bar, it was just a tap-room, and old Les would shuffle out with your pint from the 'room at the back'. No restaurant in those days! Thank you Lynne. I am having a TERRIFIC weekend as it is my birthday - more next post! It does abound with history, Norfolk, doesn't it? We love it here though neither of us 'belong' here! Hope you manage to get back for some relaxation some time. Oh what a lovely post Lynne. Such a good idea to think of a word and just go along with it. Love your harvest of fruit and veggies. There's nothing quite like getting your fresh fish and seafood from a local coastal fish stall, we do it often. Have a fabulous weekend. Thanks Patricia, I'm having a lovely birthday weekend. Lots of lovely things happening! I certainly had an abundant weekend ... full of yarn at Yarndale! What a lovely way to spend some time, in a very lovely part of the country too. I've been to Brancaster Staithe but we don't get up that far very often. Fabulous produce from the garden, its making my mouth water, we've had far too much fast food lately those fresh veggies look like just what I need!